Now, while I suspect that one day we may see a pretty decent single-disc edition, such as the recent issues of Dumbo, I actually doubt Disney finds Pinocchio a title as deserving as some of the others. Often cited as one of Walt’s greatest marvels, Pinocchio is a wonderfully lush film, rich in color, depth and inventiveness, although paradoxically it’s never been a huge seller on home video. It’s unfortunately become almost the “sacrificial lamb” of the Golden Age features, often put out on new video formats to test the waters. It debuted on both home video and DVD and didn’t sell, mostly due to over pricing and bad marketing, which Disney of course don’t accept, choosing to believe that it’s just not that much of a popular title. 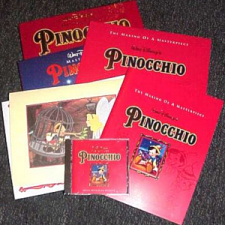 The one time we did get a Pinocchio we – and the film – deserved was when it was cleaned up and presented as the centerpiece of a deluxe LaserDisc set, released towards the end of the 1990s, and featuring some remarkable bonus materials. 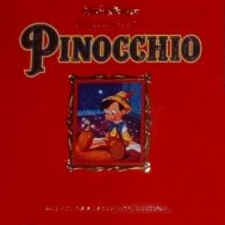 Housed in a terrific red “leather”-bound style box, the contents pulled out to reveal the two-disc Pinocchio film itself (spread over two CAV discs), as well as an extra supplemental materials disc in its own sleeve. The set also included a 20-page booklet, which read as a cut down of the Hyperion “art of…” books. Around this time Disney was pleased to include such books, and boxes for Pocahontas, Snow White, Cinderella, Toy Story and The Nightmare Before Christmas all contained such extravagant bonuses. Confined to the additional disc contained in the box, the extras begin with an interesting (but oddly padded out) documentary on the making of the masterpiece, hosted by a very excitable Robby Benson (the voice of the Beast from Beauty And The Beast). 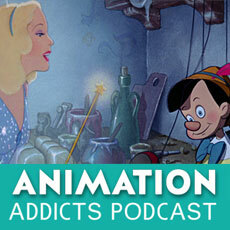 This 20 or so minute retrospective looks back on some of the artwork and concept designs, and features interviews with the animators, including of course, Jiminy Cricket’s Ward Kimball. Though suspiciously light, the documentary does feature the usual chestnuts (Kimball’s explanation on how Pinocchio’s co-star went from Cricket to Jiminy for instance) and Benson hosts from a wonderful set reconstruction of a scene from the movie. Over on side two of the supplemental disc in the laser box, there’s a chance to see artist Gustaf Tenggren’s original concepts for the Pinocchio puppet, and other conceptual drawings. There’s a look at the animators’ models and model sheets for each character, as well as inspirational paintings and completed backgrounds. The supplements continue with a range of publicity materials, including production stills, posters, paper clippings, and the entire Pinocchio comic strip from 1940 in still frame form, which provides an evening’s worth of entertainment on its own! A collection of three theatrical trailers (a great 1940 teaser, plus 1984 and 1992 re-issues) tot up the video-based material, and rounding things out is a storyboard to film comparison, which makes for fascinating viewing. The image on the Pinocchio LD is superb, rich in color and as close to the original film elements as was possible at that time. I’m sure a new DVD could spruce up the picture a little more (in the same way that the Snow White and Bambi DVDs upgraded those pictures from the 1990 LD pressings) but otherwise this is simply perfect. It’s the same transfer as that made available on the Limited Issue disc that Disney put out on DVD as part of their first wave of titles (and later re-issued in the Gold Collection line), but here I must say that the LD picture displays greater “warmth” and a less digitally compressed and more film like image. The DVD came with no bonuses other than a theatrical re-issue trailer. While the supplements are none-too extensive, this deluxe box set is a nice collection and should provide a solid basis for a special edition DVD. Jiminy Cricket became a big star after the release of the film in 1940 and went on to star in a number of other Disney productions. He was a much as loved character as any in the “mouse pack” of Mickey, Donald and Goofy, headlining such package features as Fun And Fancy Free and a host of 1950s educational roles in the I’m No Fool…series. It was rumored that at least two of these shorts (originally produced as segments for the Mickey Mouse Club) would be included in the Region 2 disc release, but they don’t seem to have made it. When Pinocchio finally has its US special edition release, let’s hope they are, along with the short series of four Figaro cartoons that Gepetto’s little kitten starred in with Minnie Mouse in the mid-to-late 1940s. Although I doubt we’ll see a deluxe two-disc DVD edition (I’d love to be proven wrong) of this classic movie, it is high time Pinocchio got the attention it deserved, and hopefully it can only be a matter of time before any such announcement is made. In the meantime, and quite how many of the supplements here would make it across, this deluxe CAV box set fills the gap nicely.